In 2007, a high school student by the name of Jennifer Barlow created the global phenomenon known as Dark Sky Week , urging people to reduce human-produced light pollution and to preserve the brilliance of the Milky Way. As we celebrate the end of this year’s Dark Sky Week, we couldn’t help but wish that nuclear testing hasn’t been lighting the skies ablaze with thermal radiation for 69 years. In 1962, the United States detonated a nuclear bomb in outer space, 250 miles above the Pacific Ocean. The military was trying to tap into an existing “radiation belt,” called the Van Allen Belt. Scientist James Van Allen had presented his discovery of the belt in 1958, and was approached by the military a day later with plans to “carry” a nuclear explosion via the belt across space to another part of the world—say, to the Soviet Union. Although silent, the 1.4 megaton blast was 100 times more powerful than the bomb dropped on Hiroshima and the equivalent of 1.4 million tons of TNT. The resultant radiation lingered in the atmosphere, creating an artificial extension of the Van Allen Belt. The test was officially dubbed “Starfish Prime,” part of the military’s larger Project Fishbowl. Civilians in Hawaii called it the “rainbow bomb” for the brilliant colors produced by the nuclear explosion. Honolulu residents gathered on rooftops at “rainbow bomb parties” to gawk at the bomb’s artificial glowing aurora that was seen from Hawaii to New Zealand. According to Cecil Cole , the scientist charged with measuring the blast, the sky turned the night sky briefly to midday, and then quickly to green. After witnessing the powerful detonation, Cole asserted that “he didn’t want to participate in that anymore,” and he resigned to become a university professor. Unanticipated by scientists, the blast’s enormous electromagnetic pulse was strong enough to interfere with satellites orbiting Earth. Hawaii experienced electrical malfunctions such as garage doors opening and closing, telephone and radio shortages, as well as urban blackouts. 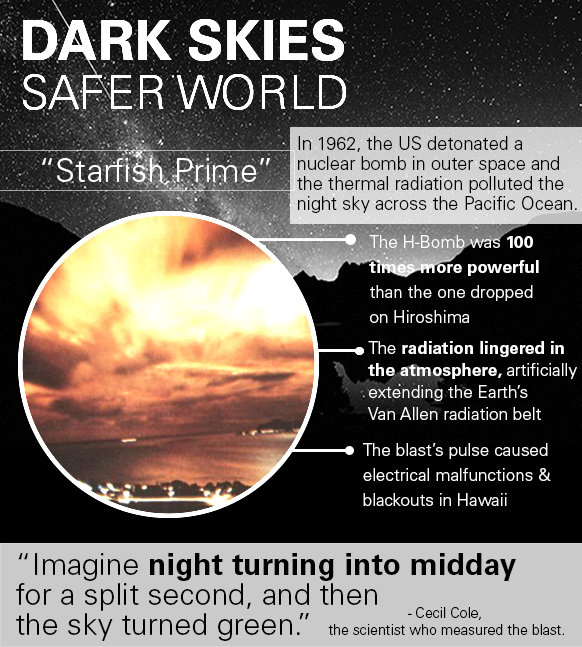 More than just a light show in the Pacific, Starfish Prime showed the world how nuclear weapons have the destructive power to alter parts of our universe. The effects of nuclear testing can never be fully known by scientists, because after all, they are tests. But experimenting with weapons of mass destruction, even when not aimed at civilian populations or strategic targets, affects the balance of our environment on a level unseen to the human eye. We know the world is safer when the sky is dark.